مارچ 2002 ۾ نڪتل اسڪينڊينيويائي اپٻيٽ جو سيٽلائيٽ ڦوٽو. سياسي طور تي اسڪينڊينيويا لفظ جو پھريون دفعو 1830 وارو ڏھاڪي ۾ شاگردن ڪيو جيڪي اسڪينڊينيوزم جي لاءِ جدوجھد ڪري رھيا ھئا. ↑ "Scandinavia". Encyclopædia Britannica. حاصل ڪيل 28 October 2009. 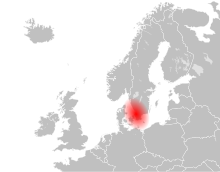 Scandinavia, historically Scandia, part of northern Europe, generally held to consist of the two countries of the Scandinavian Peninsula, Norway and Sweden, with the addition of Denmark. 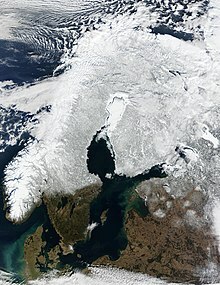 Some authorities argue for the inclusion of Finland on geologic and economic grounds and of Iceland and the Faroe Islands on the grounds that their inhabitants speak Scandinavian languages related to those of Norway and Sweden and also have similar cultures. هيءُ صفحو آخري ڀيرو 22:46، 22 سيپٽمبر 2018ع تي ترميميو ويو هو.